It is always the way when you get home from a really good trip abroad that the dirty washing must be laundered. Yes: while we at Kate Shrewsday have been languishing in dreamy glass-clad minimalist aestheticism, or gawping at Roman concrete, the characters back at the mansions have been leading a merry old dance. For when I waved you all off at the airport the dog and the kitten had not even met, and Al was still a pre-school boy. It has been a hectic week. The cat has gained in confidence with every passing day. He has even stopped bolting behind the sofa when Macaulay the dog walks in. he has learnt the fine art of Frenetic Under-Duvet Torture. Being an official Black Tabby, he is the heart of darkness. All light disappears into him, which makes photography a new challenge. I have pictures of people playing with a tiny Black Hole; the dog staring dolefully at about one square foot of black nothingness; and just occasionally, every now and then, two startling Gilliamesque eyes will appear in this tiny expanse of proverbial antimatter. The dog is reproachful. You bring me this furry entity that stares at me out of the darkness, he emanates, and expect me not to be perplexed? This is my company for the next twenty years, is it? Every time I say hello the black hole punches me. With a paw. With needles in it. The kitten gets all the good laughs. Macaulay is beginning to feel his moustache is passe´. We pet him and tell him he’s special, but his nose is out of joint. The kitten has been invaluable during Al’s first half-days at school. Who goes to school after lunch? Seriously? We have a fun packed morning and then I turn Al over to the school authorities at 1:15 dressed in a diminutive school uniform and a beam from ear to ear. On Saturday Al woke up gurgling with laughter. He had played a very good game about monkeys on the computer at school with his best friend Nicholas. But this week education has been afternoons only, so the kitten has had centre stage during mornings with Auntie Kate. We were reticent about introducing Al and the kitten. We had vivid recollections of a small boy exuberantly swinging our old cat, Kit Kat, by the armpits in comradely joy. But he has respected the kitten’s space with something like religious fervour. This has been aided by the art of ‘kitten-fishing’ – a feather on the end of a string on the end of what looks much like a small fishing rod. Al holds it and swipes it round, the kitten goes nuts for the feather. Bond the kitten has kept Al the schoolboy smiling right up till lunchtime. Tomorrow is Al’s first full-time day. However will the kitten amuse himself? Posted in Big Al, Macaulay The Dog stories, Shrewsday MansionsTagged family, humor, humour, kittens, pets, schoolBookmark the permalink. Thanks, Tandy, he had a lovely time. So he is Bond! Obviously have a lot to catch up at Kate Shrewsday! We are wobbling, Madhu. He still feels like Clive to me. big family consultation ahead. I hope you can find it – poor Macaulay needs a bit of consolation still, i think. It’s obvious Macaulay isn’t getting the respect he deserves. But he appears to be exercising enormous restraint. A true gentleman. He is, Kathy, though he is a slightly disgruntled gentleman. 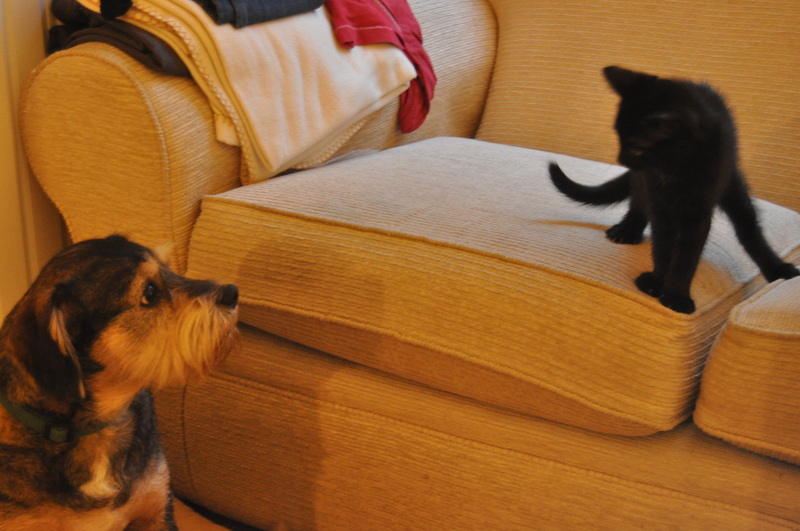 Poor Mac, I’m sure the kitten will soon have less disdain and they’ll become fast friends. Best of luck to Al in the world of full days.. Thanks, Cindy. The beginning of an era. What a beautiful blob of agile anti-matter. I see he is even allowed to share in breakfast. Not really. That was just a photo op. We are being strict, honest. Nice lot of kitten action as the family days unfold and he embraces them. Macauley seems benign. And let him know from me his moustache is not passé, but may be the only protection he has. Show him pictures of the horse guards and let him draw his own conclusions. 😀 I’m off to google some right now, Isobel. Excellent tip. What a *lovely* blog! Such fun, Kate 😀 Frenetic under-duvet torture is The Best!! Mine still indulge… Mac looks suitably resigned and perplexed – such a gorgeous boy. He is very patient, really, Jan. The kitten is finding its paws rather fast. I love the really bog rods you can wave across a whole room. Drive the cats nuts. A delightful portrait of two youngsters taking their first few steps at the same time. They are a funny pair, Rosemary. Agony is right! Those claws! They will. Things are already settling, IE. Love Big Al stories and Bond is just the trick to turn the home into energy unleashed.Poor Mac has such a strange look, not forlorn, just sort of asking what did I do to deserve this in my life? I know: I have felt rather guilty of late for not involving him in the choosing, Lou. It is not easy when a young blood comes to sit on the sofas. Oh Macaulay! While your new companion is amusing, I have not forgotten your mustache! I feel for him especially as the feline adventurer sticks his whiskered face into the breakfast bowl and Mac watches, perplexed at the boldness. It is hard on a small dog, Cameron. It’s a dog’s life. It is happy but very hectic, Debra. I shall be glad when we are all in routine. I love the one with Bond’s head in Phil’s bowl. ‘Black Hole’ is a good way of putting it. The black half of our Gem & Ni, Nigel, also tends to vanish from recognition in a photo. Love the Macauley look of outraged perplexity. Poor old dog. Not easy to explain to him why this cat is allowed on all the chairs while he, the senior partner, must stay on the floor. If he lived in SA he would be dancing and waving a traditional weapon. It is telling, isn’t it, Col? Is that the same sofa where Macaulay attempted to bury the bone? If so, what must Mac be thinking as Bond takes ownership of the space? Possibly that has something to do with the dog’s forlorn expression? I hope that Big Al’s not only entertaining Bond and that someone is also playing fetch with Mac. Don’t worry Bond will find a way to amuse himself, and before you know it, he and Macaulay will have bonded in friendship. Love the photos and story. Ah there, I found photos of him…Clive Bond! A miniature of my black Duc le Chat. He is soooo sweet. I think I can smell his kittenhood. Yum. Yes, the black creatures really are a challenge to photograph. I have many black blobs, bumps and shadows. I have a photo of Duc sleeping. His upper row of teeth, his two fangs and one sole of a paw are the only hints of this blackness being feline.